Oprah Winfrey (left) and UMass Lowell Chancellor Jacquie Moloney chatted Thursday at the Tsongas Center in Lowell. Oprah Winfrey brought the house down during a spirited conversation at UMass Lowell Thursday night, helping raise more than $3 million for scholarships at the school in the process. Winfrey told thousands assembled at Tsongas Arena that she chose to visit the school because proceeds from the talk -- the third edition of the school’s Chancellor Speaker Series -- would go directly to funding student scholarships. 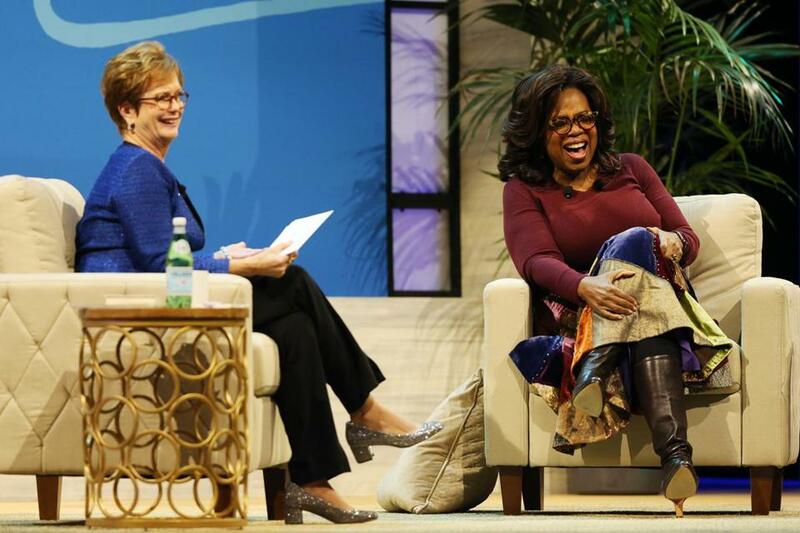 Winfrey commanded the stage all night long, speaking with UMass Lowell Chancellor Jacquie Moloney, and offering uplifting words and humorous anecdotes from her decades as a talk show host, actress, and entrepreneur. Previous talks in the series have been headlined by author Stephen King and actress Meryl Streep. Winfrey also made a point to acknowledge UMass Lowell professor Andre Dubus III, whom she credited with helping get her to the school. His 1999 book “House of Sand and Fog” was one of Winfrey’s selections for her book club, catapulting the book’s sales into the millions. At one point, Oprah briefly stoked the crowd when she used the word “president” in discussing her powerful speech at the 2018 Golden Globes. Winfrey explained that she had been given only three-and-a-half minutes to deliver a six-and-a-half-minute speech when accepting the lifetime achievement award from the Globes, which was why she gave the speech with such urgency. “I’m glad you mentioned that, because everyone keeps asking me to ask you about that,” Moloney replied. Winfrey quickly demurred, but her response was drowned out by cheers. At the end of the evening, former UMass Lowell chancellor and current UMass President Marty Meehan gave brief remarks before the school granted Winfrey an honorary degree. Moloney then announced that the school had raised more than $1.5 million from Winfrey’s talk. In her last act of the night, Winfrey announced she was matching the $1.5 million, bringing the total to more than $3 million.